I'd never really given much thought to the 'Life in the UK Citizens Test' up to now. After all, I wouldn't have to sit the test, and there were lots more pressing matters to be considering. This changed when I heard a speech on immigration from David Cameron, where he said that changes would be made to the test. This was part of a list of promises to get tougher with immigration. Every Government announces this, and every Government fails. Words to the party faithful are easy to give, but everyone should know by now that international law makes it very difficult for those words to be followed by meaningful action. As I've mentioned before, the European Union does not recognise 'foreigners' within its member nations; everyone is a European, and can travel freely within its borders. The case is different of course for those travelling from other parts of the world. Any immigration policy must also show that it is not discriminatory, which I think is an almost impossible task, as something will almost always discriminate against someone. David Cameron wants to reduce immigration to the "tens of thousands"; I'll not be holding my breath. 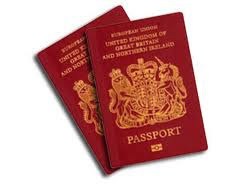 Having arrived in the UK, if you wish to become a citizen, and to have a British passport, you have to pass a Citizens Test. This is what David Cameron said about the changes that will be made to the test. "There's a whole chapter in the citizenship handbook on British history but, incredibly, there is no question on British history in the actual test. Instead you'll find questions on the roles and powers of the main institutions of Europe and the benefits system within the UK. So we are going to revise the whole test ... and put British history and culture at the heart of it". I was now intrigued; what was the test like? So, along with thousands of others, I took an on-line practice test. Actually, over the space of a couple of days I took three different on-line practice tests, but before I give you my results, let me say something in my defence. I didn't read the Official Handbook beforehand (cost £9.99); I did no other preparation; I've never been very good at tests, and I thought the whole concept was a load of tosh. 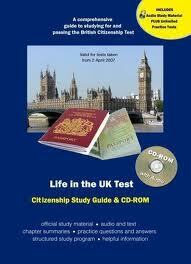 There were 24 questions in each of the tests, as there is in the final Citizenship Test on the day. In the first test I got 12 questions right; in the second test I got 15 questions right, and in the third test I got 16 questions right. The passmark is getting 18 questions right (75%), so I failed in all three tests. I didn't know enough about life in the UK to be allowed indefinite leave to remain. All of the tests were based on the Official Practice Citizenship Test documentation, and one of the tests I took was provided by the Guardian on-line, who did point out that the test contained some out of date information. They were right, as on a couple of occasions I found myself arguing with the site, in much the same way as I used to argue with the computer when it refused to let me play a perfectly good chess move. My downfall in the Guardian test was that I didn't know whether in the 1980's the largest immigrant groups were from the West Indies, Ireland, India and Pakistan was true or false. I also didn't know why recruitment centres were set up in the West Indies in the 1950's. I failed to know in what year married women received the right to divorce their husbands. Also I didn't know the number of children and young people up to the age of 19 who were in the UK, or the percentage of people in the 2001 UK census that were Muslims. How many days a year schools must open also defeated me, as did the difference in the hourly rate of pay for men and women. My option to stop young people playing tricks on you at Halloween by turning a water cannon on them was not available, so I failed that as well. What to make of it all? Candidates for citizenship will need to purchase, and read the Official Handbook, which provides all the information that is required to pass the test. This is where the whole thing is farcical for me. The test is not a test of knowledge, but a test of memory. But isn't that the same with all tests? I'm sorry, but I've always felt that exams/tests only show the ability of someone to absorb lots of information for a given purpose in time - the test. I accept that my view may be coloured by the fact that I'm generally useless at exams, but have always been very good at course work, writing essays or a true form of continual assessment. So the ability of applicants for citizenship to memorise loads of facts and get at least a score of 18 out of 24, makes them successful. But why does the fact that they know there are 646 parliamentary constituencies, or that Ulster Scots is a dialect spoken in Northern Ireland, or what a quango is, or that Hansard is the official report of the proceedings of Parliament, or when the first census was carried out in the UK, why does this mean that they will make good citizens? So if David Cameron has his way and British history will be at the heart of the new test, candidates for citizenship will know the date of the Magna Carta; the wives of Henry V111; the battle of Waterloo, and the role of Churchill in the Second World War, but will that make them good citizens? Conversely, as a BBC poll showed that fewer than half of those under 30 in the UK could identify Sir Francis Drake as the key figure in the defeat of the Spanish Armada, or that one third of them did not know that William the Conqueror won the battle of Hastings; does that make them bad citizens? I yield to no one in the appreciation of the importance and value of history, but being a citizen has got to mean a lot more. I understand that there has got to be some gauge for acceptance into the country, and apart from the ability to speak, or the willingness to learn the language of the country, surely one of the important considerations should be what positive contribution can someone make to life in the UK? But what do I know? I'm not suitable for citizenship myself, as I failed the test - three times.